Top shelf, fine art photographs of quality cannabis flowers printed on metal. The printing on metal creates an unparalleled, almost 3D luminescence. Owner and photographer David Allen can be commissioned by farmers, cultivators, creators, and geneticists, to travel to their farms, document their own unique strains, and showcase each distinct variety in detail when the flower is at its medicinal peak. $100 Amazon gift card for each team member. Trellis hat and Trellis T-shirt for each team member. The 3 winning teams will get to travel in luxury on the amazing TourBuds bus, round trip from Toronto to Niagara Falls on Friday Sept. 7 after the hackathon ends. First prize winners are also receiving a Pax 3 Vaporizer Complete Kit curtesy of Hotbox Shop and Lounge. Hotbox is one of the oldest cannabis retailers in North America bringing customers the best lifestyle products and accessories on the market. The prize is valued at $350. Original GrowUp Hackathon LyricMerch T-Shirts with lyrics for "Easy Skanking" printed on front. We'll outfit each winning team! One year free Leaf Club membership for the winning team (up to five members) + Five Office Hours sessions with the Leaf Forward team. Cannabis & Tech Today subscription. Cannabis & Tech Today is a quarterly publication specializing in technological advancements, business innovations, and popular culture pertaining to the marijuana industry. We are enhancing consumer awareness, reducing societal stigma, and fostering a culture of acceptance, responsibility, and inventiveness within the cannabis community. Interested in the intersection of tech, innovation, creativity and business for the quickly evolving cannabis industry? 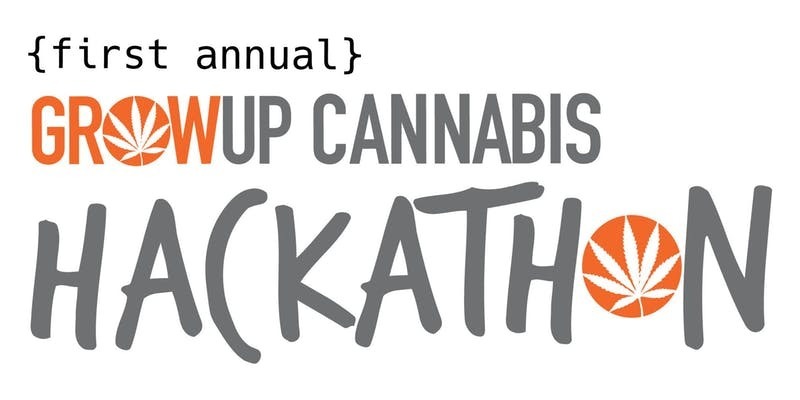 Welcome to the inagural Cannabis Hackathon for the 2018 Grow Up Conference. The Hackathon will take place in Toronto Sept. 6-7 and then after a 24 hour overnight hacking session, the winning teams will be taken to Niagara Falls for the awards presentation and ceremony. Competing coders, designers, and engineers will explore ideas for tracking, purchasing, reporting, strain identification, verification, integration with the entertainment industry, and much more. Our sponsors and partners: Trellis, LyricFind (will offer cannabis themed songs in their API), LyricMerch, Leaf Forward, herb.co, Cannabis & Tech Today, TourBuds, Hotbox, Rosenzweig & Co, Merry Jane, Brainsights, Beanfield, MediaZoic, Hacker Noon and Devpost. Plus restaurant partners Smoke's Poutinerie and Quesada Burritos. Teams are limited to 5 members. Participants must be at least 19 years of age. Must have coding experience. Previous Hackathon experience preferred.